We recently spoke about the Investec Hockey Academy and looked towards some of the coaches that are giving back. One of those coaches is Bernadette Coston, one of the best hockey players in South Africa, and we jumped at the opportunity to chat to the star of the IPT winning South Gauteng side. Jabu: Having played in the Commonwealth Games, the Olympic Games and the World Cup, which was your favourite event? Bernadette: Definitely the Olympic Games! It was one of the best experiences of my life! Jabu: How are you feeling about the fact that we will not be going to the Olympic Games? Bernadette: Well that is not set in stone yet as we still have a chance of going depending on what happens at the Africa Cup. Jabu: Speaking of which, the African Cup is coming up in Johannesburg soon. How has the quality of African Hockey improved? Bernadette: We can never underestimate any of the African team as we don’t get to play them often. Jabu: You are a veteran of the side at only 25, how important was your schooling in becoming the superstar that you are? Bernadette: It definitely gave me the base of skills I have today. We also played on grass which helped a lot with my hand eye coordination especially. Jabu: What can South Africa do to improve the retention rate of hockey players from school to after school? Bernadette: Get the girls involved in club hockey as soon as possible so that they can get exposed to a higher level of hockey. Jabu: Having played for the victorious UJ in 2013, what was your Varsity Cup experience like? Bernadette: I couldn’t play this year as the capping age was 25. My first one (2013) was an absolute blast up until I fractured my foot! Jabu: And what makes UJ the hockey beast that they are? Bernadette: We are good friends on and off the field. We have an incredible coaching staff and medical system in place taking care of us. Jabu: What is your favourite international goal you have scored? Bernadette: We had an Investec Cup tournament pre the Olympic Games and I scored in the top left corner vs Great Britain. Jabu: We know you looked up to Kate Woods, who else has played a massive role in your career? Bernadette: Definitely my family. They have supported me since day one!! Jabu: How hard has it been to study while touring the world with SA Hockey? Bernadette: It has been one of the most difficult challenges I have faced, but if you put your mind to something and believe God will help you, you will be able to succeed! Jabu: What is your big hockey goal going forward? Jabu: Where can I readers interact with you more? 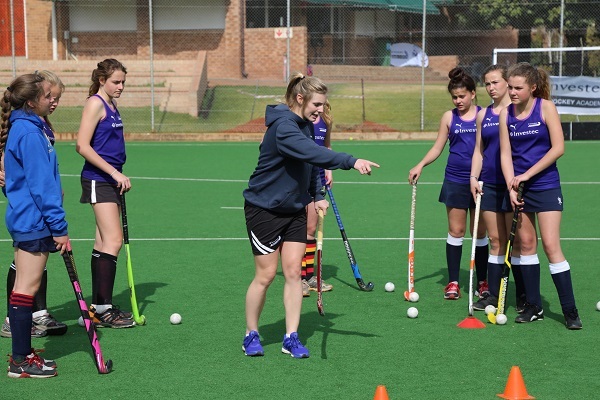 Watch out for more action from the Investec Hockey Academy where Bernadette is one of the coaches, helping develop our South African stars of the future! The next dates are the 3-4 October at Crawford College in Durban and the 12-16 December at St. Mary’s School in Johannesburg.